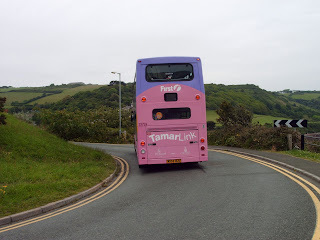 First Devon and Cornwall recently took the decision to send away Torpoint’s only Volvo Olympian 34002(K802 ORL). 34002 had not been with Torpoint all that long. She came in late early 2006 where she replaced 38846 and 38847 two of the three remaining Bristol VRs. 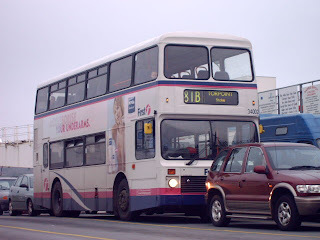 Though she was quite an unreliable bus (phrases like “She spends more time off the road than on the road” and “Shocking”) she in my opinion was the best bus at Torpoint when the VRs had gone. She had a 300hp engine and lovely coach seats. But early this year she was sent away to Laira depot to undergo a major overhaul to iron out her problems (see issue 002). I remember the first few days, she was on my route, just amazing compared to the Leyland Olympian she used to roar up the hills, but now she is used on X80 but is actually based in Callington. Good luck 34002. 52529 returns from the dead. Sorry I have not posted for a while. 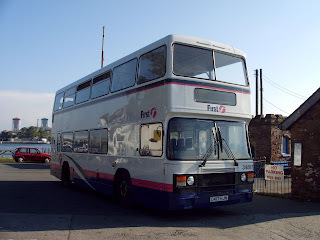 It was reported last week by me that one on the three Mercedes Varios of the First Devon and Cornwall Torpoint fleet 52529 (S529 RWP) was written off in an accident. It was found out that the crash happened with a car on a single track lane on a blind bend in between the villages of Widegates and Horningtops near Liskeard. It was reported that speed and the narrowness of the road were factors which left no time for the bus or car to avoid the accident and no space for either of the vehicles to dive out of the way. After the accident 52529 limped in tatters to Laira depot where it was thought that she would be scrapped But no. First Devon and Cornwall took the decision to renew the front of the bus, change the old wind blind for an LCD blind and give her a complete repaint. Very unusual for a big bus company but none the less very noble. Let’s just hope this does not happen again on new route 181. 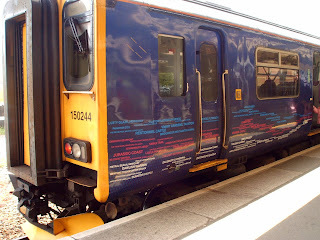 First Great Western Recently announced the new timetables and routes of the lines. But incorrect information was published saying that there was a train line to Falmouth that doesn't exist. 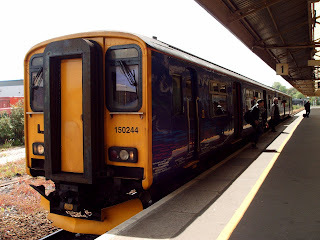 The picture I have included is one of the only two DMUs that have been repainted into First livery from Wessex Trains livery. A-Line travel has recently bought a E reg Volvo B10M with PLaxton Paramount bodywork that seeing the withdrawal of his old Bedford pictured above. 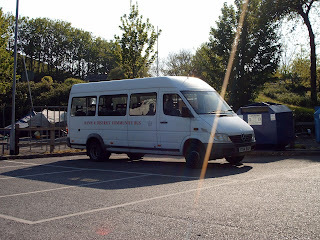 Sorry I haven't got a picture of the new or should I say old coach but it is being used on the Torpoint school run and on the Falmouth trips. He has also told me he will be replacing his ex-Southern Vectis Ivecos likely with some Mercedes 814D/811Ds . I will bring you more information on this as it comes. I have been trying to get a picture of the new branded Plymouth Citybus buses in the Plymouth Citybus livery but I do live at least an hour away from where they run and there is only three of them and I usually have a ride on the Enviro 200s as 34 is the route I use I don't often get to see them. But yesterday and the day before luck struck but my camera didn't so I didn't get a picture of the Recycle liveried one but did get one of the Plymouth Sound one. And note I don't know why but all the special liveried buses now have the normal citybus livery on the front. I only found this out today but news in that Torpoint Mercedes Vario 52529 has been written off iin a crash on new route 181 near Liskeard aftere a collision with a car at a Junction. I hope to get more news on this and maybe a picture but I have been told that she is in Laira Bridge depot at the moment. This leaves just two Tamar Link liveried Mercedes Varios. 34002 Torpoints only Volvo Olympian has been transfered now to Callington. And last week over the course of just a few days three of the Dennis Tridents all of a sudden became unreliable and broke down. All three had to be taken into Plymouth to be fixed. Plymouth Citycoach has recently announced that the company will not be selling the company. Back in February Plymouth Citycoach announced they were going to sell up because of problems with trading conditions and rival companies. 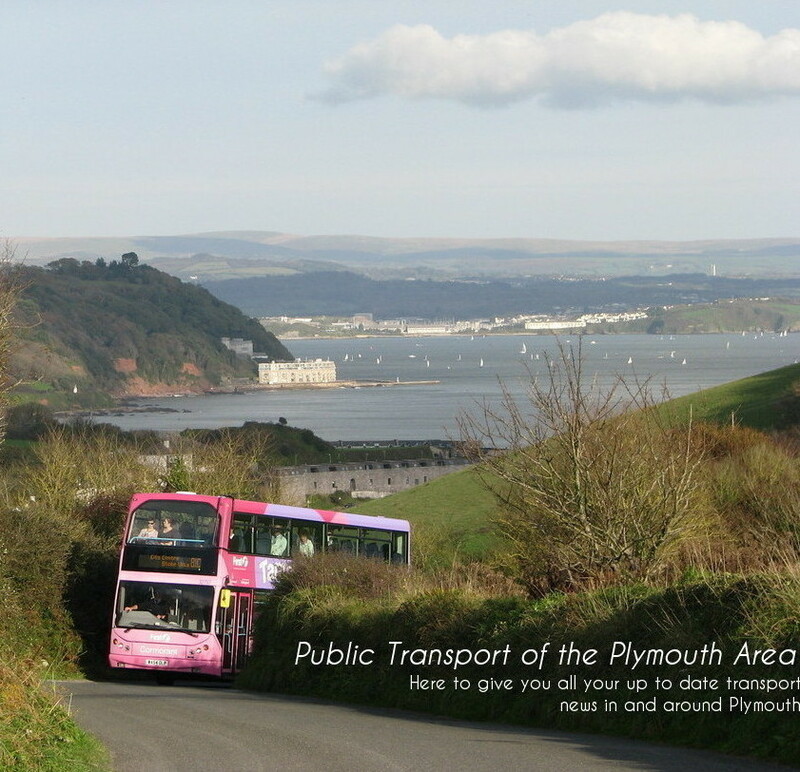 But Plymouth Citycoach have had many complaints from its loyal costumers wanting the services they provide kept. But the company has announced it will keep going after a talk with their supplier VHE ltd. So they will keep going but with a reduced fleet of buses and they are reling on the loyalty of all its costumers to keep them going. Yesterday I was told by a school girl that an Optare Solo was in Torpoint depot on school duties. This has now been confermed by her and another person as 53108/ EO02 FLH which has been painted into First livery and brought down from Essex. Apparantly the Optare Solo is acctually causing trouble. Luke Farley has been told my his sister (Bonnie Farley) that the Solo was doing the school run to Cremyll but it is usually an Olympian, they had to use a Trident which was doing the Millbrook run aswell. So then they parked at Trigantle fort and waited for 81C which was an Olympian to come so they took the kids off the Trident and the solo. Put the 81C passengers on the solo put the Cremyll people on the Olympian and put the Millbrook on the Trident so it sounds quite hectic. The buses were probebley over the limit. But the Solo probebley doesn't have a ferry lift yet so is eighter going to have to go al the way round the bridge again to get its ferry lift or be used on school runs and 181 which don't use the ferry. Onlt time will tell. Today I had my first ride on Torpoint's new Leyland Olympian C417 HJN (34817) And I can report to you she is a lot nicer in condition that the other Olympians at Torpoint. She has grey seat covers. None of them teared they are all in brilliant condition. There is no scratches or bumps on the bodywork so they must be doing something right up country. The gearbox and engine are working very well very smooth changes and a very good sounding engine which I will upload a video soon. She blasts up the hills even better than the old VRs used to (I am sorry to say). So all in all she is a very good bus. Sad to see her be thrashed and trashed on this route now and with the school kids. 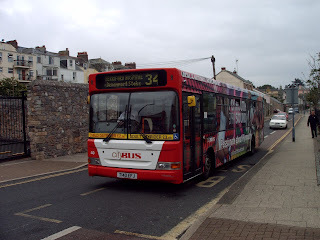 And today I saw Torpoint's Leyland Olympian 34813 on the 7A. So she is having a holiday. I am sure it is the equivalent when you work so hard on route 81B/C. Sorry I have not done the story about the boats yet I am finding more relevant news to the area but it will eventually happen I promise. Hello. Sorry I didn't post yesterday. As Luke hijacked my blog again I thought that would be enough. 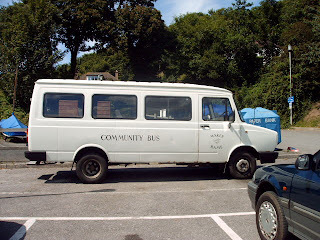 Today passing Willcocks and Broad's garage in Millbrook I spotted that the Cawsand Community bus was in the garage. It is currently having its MOT and some mechanical part replaced but I don't know what it is. Just to tell you a little bit about the bus it is a she is a 'Y' reg Mercedes Sprinter with the best 413 turbo diesel engine. Registration Y194 BAF. She can seat 17. She became our community bus at the start of last year when we bought it from Downderry and District Community bus. 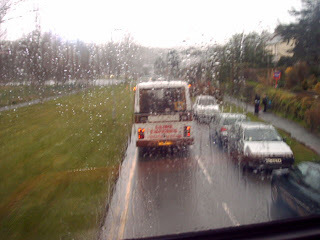 It had been used daily or near that since new as they used the bus for the school run and trips very often. She is a very good bus compared to the old LDV also pictured but is proving to be very expensive to maintain and run so the charity is finding it difficult to fund it. It is at the moment do as many trips as possible and run as many coffee mornings as possible. I myself preferred the LDV. One of the last vehicles in the fleet to retain the 'barbie 2' colours is S536 RWP (52536). The vehicle has been operating Torpoint services recently, and is pictured opposite Torpoint depot on June 4th. Ex-Bristol based Leyland Olympian, C417 HJN (34817) has arrived at Torpoint. It is fitted with an LED destination display, and is painted in a non-standard variation of First colours. 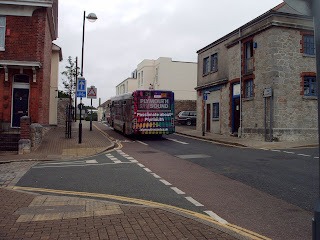 The bus is pictured at Torpoint depot on June 4th. 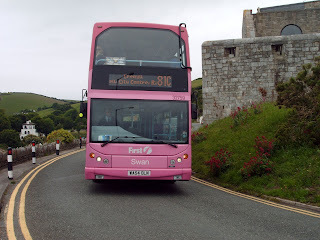 Here we are a picture of 32759/WA54 OLN/Egret on the 81C passing Cawsand fort. Hello. I have returned from my week in France so I won't have much news from the area so I might talk about french public transport a bit. Firstly I would like to publicilly thank Luke Farley for covering for me while I was away. It all seems to have gone well. At 9:54 I am going to go and take my first picture of 81C and I will publish this soon after. What I do think is that French Public transport is rubbish. I was going to have a trip on one but there was no bus near me and I can't speak french. But there arn't any anyway. There are loads of bus stops but no buses for them to stop at. I did pass one depot at about 9:00 so the rush hour and the depot was full. All the buses were sitting there idel and the bus station was desurted. 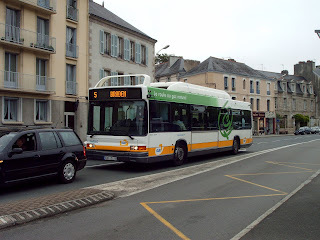 The only place i did see a bus network all be it 5 frequent routes was in the town of Quimper. There was not even any or very few the the capital of Brittany Vannes. But the Quimper buses are quite nice. One is pictured above. I would say around 50% of the buses there were gas powered. So we are quite far behind in that aspect But hardley any of the buses are low floor so we are ahead on that aspect. 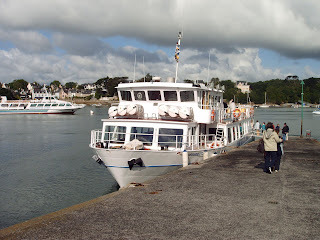 And really that is about it except a ferry company which I will talk about tommorow and one of them is pictured above.